Special diodes that have a low reverse voltage rating are called zener diodes. 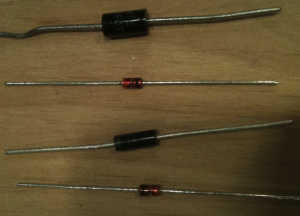 These diodes got their name from C. A. Zener, who experimented with voltage breakdown of electrical insulators. Zener diodes were made to function with current flowing through them in the reverse direction. These diodes typically have a reverse breakdown voltage between 3 to 200 volts. Once the reverse breakdown voltage of a zener diode is exceeded, the current starts to flow with very little restriction. This is referred to as an avalanche condition. This in turn allows zener diodes to also be known as avalanche diodes. Also avalanche current can be referred to as the zener region. If the electrical values of the diode are not exceeded, they can safely operate within the zener region. The breakdown voltage is determined by the resistivity of the diode. This is determined by the doping technique used during the manufacturing. The breakdown voltage is usually rated at 1 to 20% tolerance. The ability of a zener diode to dissipate power decreases as the temperature increases. Diodes are given their own power dissipation ratings according to specific temperatures. A De-rating factor is also given by the manufacturer to determine the power rating at different temperatures. Avalanche Multiplication - A thermally generated carrier falls down the junction barrier and acquires energy from the applied potential. This occurs when carriers collide with crystal ions and passes enough energy to disrupt a covalent bond. Large amounts of reverse saturation current occurs and the diode is said to be in an avalanche breakdown region. The zener is often used as a voltage regulator, since the voltage drop across the diode is constant. The supply voltage must exceed the zener voltage for the circuit to operate. Any device connected in parallel with these diodes will have the same applied voltage. Zener diodes are used in surge protectors to control transient voltage spikes. Zener diodes are also used by random number generator programs because of the unique niose created within the avalanche breakdown region. Zener diodes are created by heavily doped N and P type semiconductors. Different doping quantities allows for unique breakdown voltages. Different breakdown voltages coincides with different voltage capacity. Percentage of voltage per degree change in diode temperature, is known as the temperature coefficient. The coefficient can be either negative or positive. An increase in temperature can increase the energies of the valence electrons. This makes it easier for electrons to escape from the covalent bonds. Less voltage is required to pull these electrons from their positions and convert them into conduction electrons. Zener breakdown voltage decreases with negative temperature coefficient. 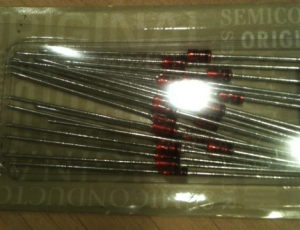 Zener diodes can be tested very quickly for shorts, opens, or leakage with an ohmmeter. The ohmmeter is connected in forward and reverse bias. A regulation test with a power supply must be used to determine if the zener diode is regulating correctly. The max zener current, is the max reverse current that can flow in a zener diode without exceeding the power rating. The reverse current represents the leakage current before breakdown at a specified reverse voltage. Breakdown voltages of 5v or more have a positive zener voltage temperature coefficient. A breakdown voltage of 4 or less will have a negative zener voltage temperature coefficient. In this circuit a motor is connected in parallel with a battery. The zener is connected in parallel with the battery and the motor. Since the components are connected in parallel, the zener will not allow the voltage supplied to the battery to exceed 14 volts. Here is a video that further describes a zener diode.